Few capital cities can boast a tropical rain forest within driving distance, but Kuala Lumpur can. The Forest Research Institute of Malaysia (FRIM) is a 3,775-acre (600-hectare) expanse that’s home to hundreds of plant species. Visitors can hike along trails that pass secondary forests, a river, and waterfall. With a convenient location in Kepong, about a 45-minute drive from the center of Kuala Lumpur, the Forest Research Institute of Malaysia can be visited in just one day, making it an ideal attraction for travelers with limited time. Highlights include the towering timber trees along the Keruing nature trail and the giant arowana, a fish measuring more than 7 feet (2 meters) in length. You can also explore the park during day or night. FRIM is a must-visit for nature lovers. A free fish spa is located at the entrance of the reserve. The most accessible trails are the Keruing Trail and the Salleh Trail. FRIM also has a campsite where you can stay overnight. Advance booking is required. From Kuala Lumpur, you can hire a car and drive 30–45 minutes to the forest via Route 1, or take bus 152 from central Kuala Lumpur. Driving or taking a taxi is undoubtedly the best way to access the park, and also allows you to make a stop at the nearby Batu Caves. FRIM is open from Monday through Friday, 8am to 5pm. Guided tours can be arranged upon arrival. 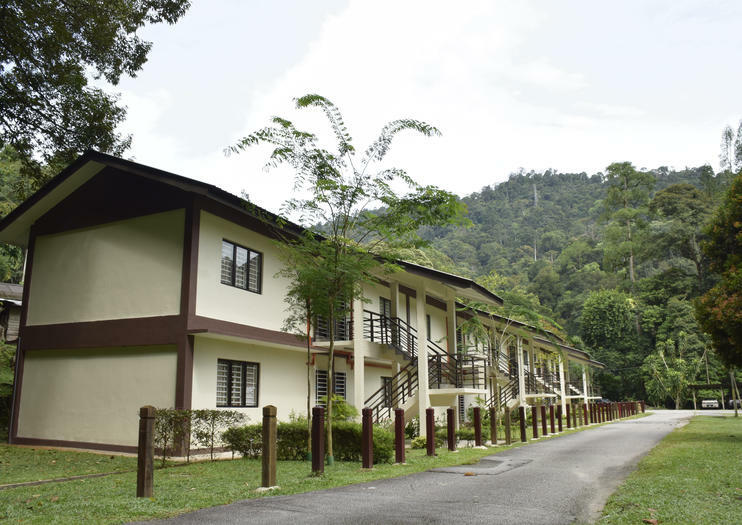 The Forest Reserve Institute of Malaysia is home to a phenomenon found in only two other places in the world. The oddly named Crown Shyness refers to a mosaiclike pattern created by leaves when they “shy” away from one another and leave distinguishable gaps between the trees. The phenomenon can be observed by gazing upwards. If you’re short on time but would like to experience authentic tropical forest, try this convenient half-day tour to the Forest Research Institute of Malaysia (FRIM) on the outskirts of Kuala Lumpur. Learn about Malaysia’s indigenous people at the museum, then discover the area’s rich flora and fauna as you stroll the nature trails with a guide. Tour includes round-trip transfers from selected hotels: upgrade for a private tour. Get out of the city to hike the tropical rainforest on the outskirts of Kuala Lumpur, visiting an aboriginal museum that explores traditional culture. With free time to hike through the rainforest, you can spot local plants in their spectacular native habitat; it’s a dramatic contrast with Kuala Lumpur’s bustling downtown and a great way to recharge in nature. Delve deep into the Malaysian rainforest on this 4-day Taman Negara adventure from Kuala Lumpur. Spot native nocturnal wildlife during a forest night-walk with your guide. Paddle upstream to Lata Berkoh and test your nerve on Malaysia’s longest suspension bridge. Hike up Teresek Hill to Mount Tahan and enjoy stunning views over the dense forest below. Swim in the Lubok Simpon water hole or spot wildlife from a secret hide. Meet local tribe members at the Orang Asli settlement, then splash through thrilling rapids on a white-water rafting trip. FRIM or Forest Research Institute of Malaysia,located at Kepong, is a must for all nature lovers who are in the capital city of Kuala Lumpur. It is located in the suburb city of Petaling Jaya, approximately 16 km north west of the capital city. It was founded in the year 1929 and is one of the leading institutions in tropical forestry research both locally and abroad. This 600 hectares tropical forest contains a wealth of flora and fauna with approximately 15,000 species of plants though for a layman in botanic, all of them look like greenery. Take a walk on the wild side and explore one of the world’s oldest rainforests on this 3-day Taman Negara adventure, including 4-star accommodation, meals and transfers. Cruise down the Tembeling River by motor canoe, then get a taste of local life as you pass traditional ‘kampongs’ and take a jungle survival class. Keep a lookout for colorful birds, monkeys, tapir and wild boar as you enjoy a thrilling night hike through the jungle, then get an aerial view during a treetop canopy walk.